Antietam. Bull Run. Fort Sumter. 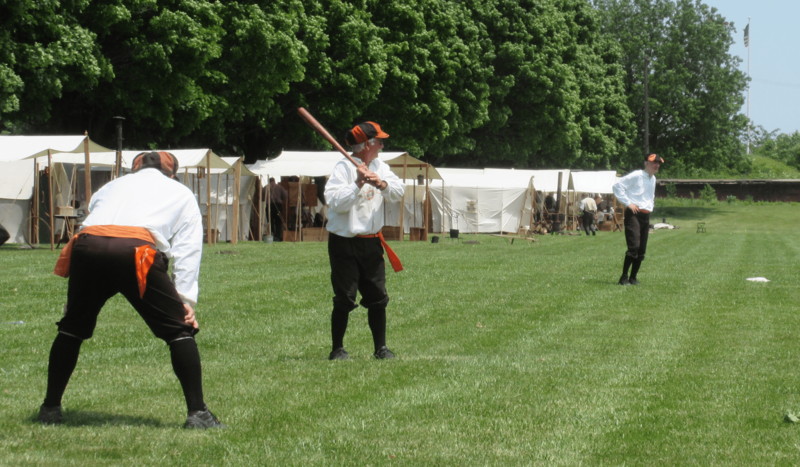 Another notable historical battle was added to the list during Civil War Days at Fort Wayne. Nestled along the Detroit River, the Early Risers hosted the Eclipse Base Ball Club of Northville on a humid June afternoon. Recent matches between the two clubs have entertained fine fielding, stingy pitching and scarce tallies but the match in play triggered a tally keeper’s nightmare in keeping his pencil sharpened to account for the activity of the ballists. The Eclipse took the early lead in the first inning as a result of a three bag hit to deep center by Stretch, who continued his impressive new role as a lead off striker. Chip tallied him on a grounder to the right side, while Frisco singled and scored on another three bag hit by TinMan, eventually scoring on a single from Bender. The sticks whispered in the next few innings for the Eclipse as they clung to an early 3-2 lead. The Early Risers then proceeded to plate seven runs in the third inning with the highlight coming off the bat of Cue Ball who launched his own cannon shot into the artillery regimen in the deep left fields, scoring Spotty and Pokey. The Eclipse answered with their own warning shot in the next inning as Jaundice found open room in right field with a triple to plate two runs and Handle found an opening to the right of the mid outfielder to attach his own name to a triple. Eventually the black and orange club tallied six and the two clubs were tied at nine through four innings. The Early Risers continued with their firepower as they tallied six runs in the fifth inning and three more in the sixth inning. However, the Eclipse refused to surrender and they reloaded their bats for another assault in the sixth inning as Handle led the charge with a three-run bases-clearing double as part of a six run inning. Handle, who enlisted in the Northville club during its infancy, occasionally makes appearances in times of need and it was reported that he spent a good deal of time whittling wood into fine pieces of bats. On this day, he carved up the normally difficult to connect offerings of Hatchet from the Early Risers to the result of four hits, including a double and triple, and seven runs batted in. The Early Risers added to their 18-15 lead in the seventh inning with three more runs, but once again the Eclipse responded with two runs of their own. The eighth inning saw the Early Risers’ Hickory chase after Scallywag on the bases as he delivered a hard liner as deep as it was futile to catch into left field, resulting in two more tallies. Trailing by six runs, the Eclipse mounted yet another miraculous comeback. Zebra led off the inning with a single, followed by a matching hit to left by Stitch. Stretch doubled to right, scoring Zebra and the Chip plated Stitch with a ball to left field. Frisco homered to center, scoring Chip, while TinMan and Bender capped off the scoring as a result of a single by Handle and a muff from the catcher. Play was halted after eight innings to give thanks and remembrance to those who served during the war and both teams were pleased to settle their differences with a 23-23 tie. Hickory led the way for the Early Risers with five hits and four runs, while Cue Ball, Stovepipe and Snurek all contributed four hits apiece for their club. Meanwhile, the Eclipse had Handle lead the way and was accompanied by Stretch who tallied two runs, two runs batted in and three hits, Rev who also tallied two runs and two runs batted in with his four hits and TinMan who tallied five runs, four runs batted in and four hits.